I hope you’ve had a great week. Before we begin, I’d like to send a shout out to my son, T, who turns 14 today. I can’t even believe it. We’ll start drivers’ ed for the written test in 6 months, and in a year, he’ll have his permit. ::sniffles:: He’s growing up into a great young man…which might seem an incongruent segue to my title’s topic, but Proud Mom is Proud. If that’s true–why are they still selling? Because, let’s be honest, they are. And they’re getting more and more creative. (FYI, be on the lookout for Jenny Martin’s TRACKED later this year–trust me : D) From Pierce Brown’s class warfare/futuristic Roman society/space opera Red Rising series, to Divergent, to This Shattered World (and so on), dystopians are still coming out, and still selling. So, why? I have a theory, and it’s part of the reason I selected my particular brand of “societal collapse” for UNSTRUNG–economics. We’re living in an increasingly dystopian world and teens (and adults) are gravitating toward the fiction because it shows a mirror to where we might end up, and how one might fight back. Terrorism, economic upheaval, environmental concerns, emerging technologies–they all point to something strange and unlovely, which might be why the doomsday clock got moved forward again. Now, this little essay might seem like a bummer, but the optimistic part of me likes to believe dystopians are popular because we’re trying to recognize the ultimate end game before we get there so we can fix it. The pessimistic part thinks we’re fascinated by where we’re going and can’t look away. Whatever the reason, though, if you look up the teen/dystopian section on Amazon, you’ll see they’re selling at a very brisk pace. Which means our fascination isn’t waning. So–what do you think? 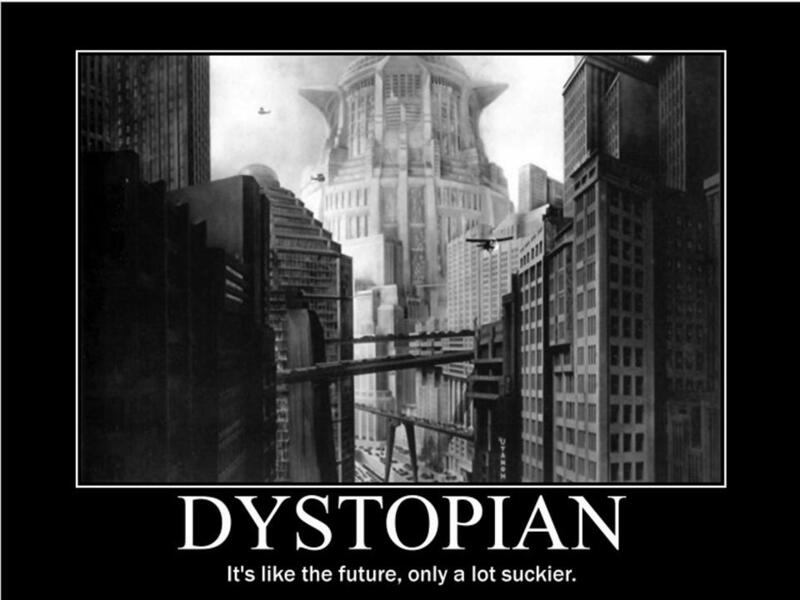 Why do you think dystopians are still doing well? Do you think they’ll continue to sell, or will they fall out of favor? This entry was posted in Blog on February 5, 2015 by Kendra. I think they do well, (they’ve always done well when you think on it. At least in movies. Terminator, Escape from LA, Mad Max. I think the audience and writers now are coming from those early/mid-80s influences and are shaping it into what we’re reading now.) We also have situations were life is definitely or could definitely mirror art. Again it’s a movie reference but Gattaca is about genetically altered people to create a more perfect society, and they are talking of creating designer children. It’s a little distressing, but hopefully it won’t become like the Gattaca society. I agree–these stories have been with us for a long time (1984, anyone?) and I think they’ll continue to be.